If you had followed my blog entries this last summer you are aware of the ongoing battles with the resident beaver. I write beaver in the singular form, because my hopes are that only ONE beaver calls the farm home. 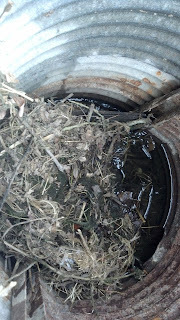 Anyway, this particular beaver found a way to clog the discharge pipe on one of our ponds. The picture below shows the pipe with the access plate on top of it. The photo below shows the handy work of our friendly beaver. It might not look like much, but a clogged discharge pipe creates higher pond water levels. This particular pond was 10 inches or so higher than usual. Joe expressed concern that all the excess water could create a breech in the bank or dam. All of the debris has been removed in the below photo. Take notice of the channel iron that makes a frame across the bottom of the discharge pipe and up both sides of the corrugated wall of the discharge pipe. 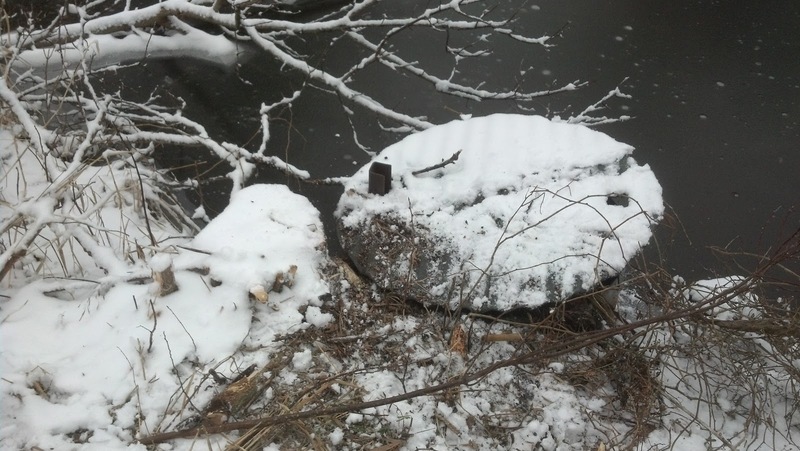 By dropping boards in that frame, or removing them, the depth of the pond is directly controlled. 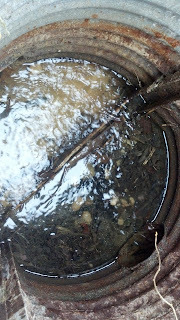 In the photo below, the pipe in the bottom right is coming from the pond. Lets call it the inlet pipe. If you look closely you will see an outlet pipe directly across from the inlet pipe. As you might notice the volume of water moving through doesn't appear to be very substantial. This makes me think debris is also plugging the opening of the inlet pipe. That opening is out in the pond and currently under ice! Anyone know of a good pond plumber?